Cut your sweet potatoes. It’s best to cut them “the long way” to get delicious looking sweet potato fries. Try to get them into reasonable sized meaty wedges. Place the cut up sweet potato into a large bowl and add two tablespoons of vegetable oil, a teaspoon of garlic powder, half a teaspoon of paprika and a dash of salt and pepper. Mix everything and ensure that the sweet potatoes are evenly coated with the oil mixture. 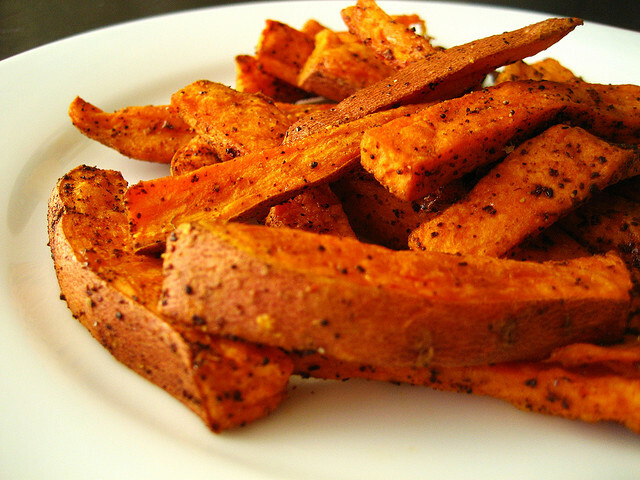 Place the sweet potato fries onto a baking sheet and bake for about twenty-five minutes. About fifteen minutes in, turn the pan to ensure that the fries bake evenly. When they’re done the sweet potato should be slightly golden on the outside. You can experiment with different spices. Popular choices include cumin, chili powder, or even cinnamon. Depending on the size of wedges you cut, you may want to cook the potato for varying amounts of time. Start checking on them about fifteen minutes in if you’ve cut them small. Check out these “regular” french fry alternatives: Baking homemade french fries, or deep frying your own french fries.